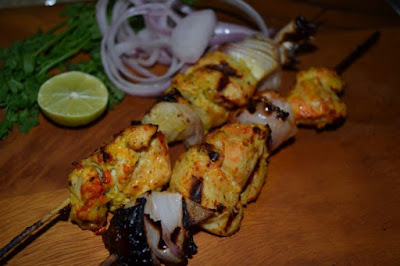 Chicken Malai Tikka is made with small breast pieces of chicken marinated for a few hours with malai or cream mixed with Indian herbs and spices, rolled over skewers with onions and then cooked over a grill or a tandoor. However, you can even pan fry them with a little oil. True to their name these Malai Tikka are tender and soft and are usually favorites for evening and dinner parties as starters. They go well for both adults and kids and are a sure shot way to make the party menu successful. So go ahead and make your evening enjoyable with this easy to make recipe of your favorite Chicken Malai Tikka. 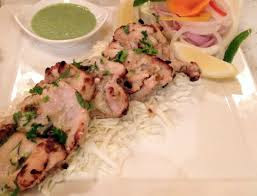 Chicken Malai Tikka recipe is one to try out if you want to have a fancy dinner or want to impress your family members. This is very easy to prepare and gives you unique taste of Chicken Malai Recipe so let’s try this recipe that is specially brought to you from the desk of expert and give your views. Pour the curd in a muslin cloth and hang it for 2 hours. Remove the thickened curd from the cloth. Add curd and chicken in a bowl. Mix all the remaining ingredients and cover the bowl with a cling wrap. Refrigerate the marinated chicken for at least 6 hours. For better results, keep it in the refrigerator for 10- 20 hours. Take some wooden skewers and put chicken pieces, alternating with onions. Grill on a barbeque or in a pan over the gas, till slightly browned. Apply a little oil while grilling. Serve hot with lemon and onion rings. • Sprinkle lemon juice and salt over the chicken pieces, cover and set aside. • Mix the yogurt, half the butter, the cream, adrak lahsun ka masala, cardamoms, cumin, nutmeg, chillies, the oil, and cheese and blend into a smooth paste. Pour over the chicken, making sure it is all well coated, and marinate the meat for 1 hour, covered, in the refrigerator. • Soak 4 – 6 wooden skewers in cold water for 15 minutes to prevent them burning. Skewer the chicken and barbecue, or grill under a preheated grill, for 10 minutes on each side until light brown and cooked through, or simply bake in a preheated 180°C / 350°F / gas mark 4 oven for 15 minutes or until the chicken is cooked. • Halfway through cooking, baste with the remaining butter (melted). • Serve hot or cold on the skewers with zeers rice or khasta roti.